“Are you free tomorrow?” Phil asked. You have to be careful about how you answer that question when Phil asks it. He’s a sort of any-thing-could-happen-in-the-next-half-hour kind of guy. The mission: to turn up at Arrivals, Heathrow Terminal Five, with my camera. The inaugural flight of his airline’s Airbus A380 was coming in from Frankfurt at 11:50am and on it was one of Phil’s reporter/editors. He was tasked with interviewing passengers about their experiences of the new plane; and I was tasked to meet him at arrivals and take photographs of the interviewees. The A380: brand new, and the largest passenger plane in the world. Double decker, wide body, four engines and a vast 480 square metres of cabin space. An upper deck which extends the entire length of the fuselage. Seated economically, it could hold just over 850 people for a range of 15,700 km – that’s New York to Hong Kong. I turned up early, and the plane was delayed. 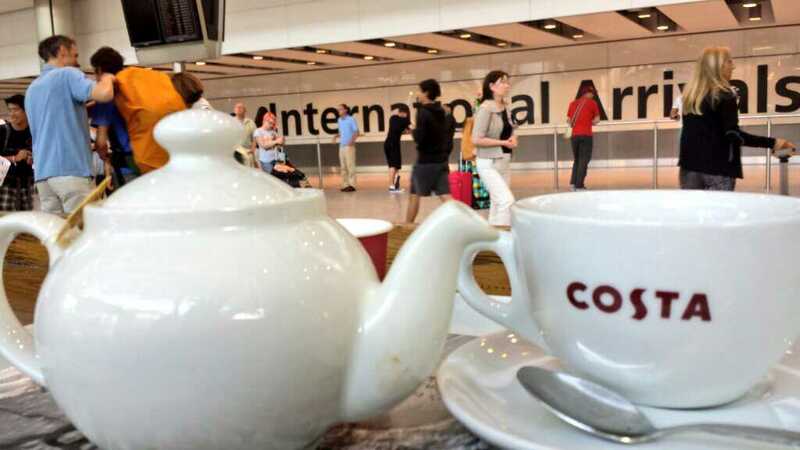 But delays at airports like Heathrow are always opportunities to sit, with a pot of tea, and watch the world go by. There cannot be many more exciting places than an international airport: people jetting in from all over the world and arriving in London. There were the inevitable chauffeurs who stood there with someone’s name, waiting to carry them off to some luxury hotel or high-powered board room; I notice some are beginning to use iPads these days to display their client’s name. I watched, and waited, and the flight arrived. And I lined up at the stainless steel rail which separates travellers from meeters and greeters. Next to me was a little family, the two youngsters jiggling with excitement because Daddy was coming home. The little girl had prepared a name card to hold up. It said: ‘Daddy’. Everyone seemed to be grinning happily. Anticipation laced the air, a palpable party feeling. And then my contact appeared, and he said, you’d better come across to this side of the rail. The reporter filled me in. The plane was packed, not just with families and travellers but with the plane enthusiasts who collect inaugural flights like this. The reporter himself had flown out at 7am to catch this plane back. It was a geeky treat. We caught everyone we needed to, and I snapped for Britain, and then it was time to ditch the crystal slippers board the bus back to my humble pumpkin, and traipse home to the kids. Posted in Shrewsday MansionsTagged Airbus A380, anglophile, Heathrow, planes, Terminal 5, travelBookmark the permalink. Ah, Ellie, I have a secret weapon: I board a flight to New Yor a week today. how exciting to be one of the first to fly in it! I would have loved to be on that flight. I have to say, Kate, that our opinions diverge here. Root canal work is preferable to any airport experience. The joy of being in a crowd of unknown fellow humans has evaded me, but being embroilded in a nervous, seemingly lost crowd of fellow humans deserves a Dante ranking . On entry into a crowded plane, travelling steerage as there’s no one else to foot the bill nowadays, I think to myself: ” I’m sure I booked this flight. I don’t remember any mention of sharing”. Roger, I have always harboured a secret wish to be a pilot. I have flown a little Cessna, and that moment when the plane leavesthe ground just gets me every time: the miracle of flight. How in heavens name have we gone from joke flying-machine byplanes to making almost 1000 people airborne at one time? We defy gravity. And for me the magic has never quite faded. I like the Cessna idea totally. It’s the 1000 people that doesn’t hold magic for me. 1000 people on a plane, a coach or the underground is the same. Necessity yes, pleasure no. The idea of flying totally grabs me too, but I’d like to do it your Cessna way. Thank Rover profusely for me, MTAC. I have never flown on an inaugural flight, but, once flew a brand new 767 that had just been flown a couple of times. It had all kinds of goodies on it and the attendants let us have everything free…..remember those days fondly, because they are now gone forever. In fact, the last few times I have flown internationally, I am bombarded with emails from the airline asking me if I want to upgrade a dinner or legroom or whatever for $$$$. Insane! The Recession has not been kind to regular fliers, has it, Lou? One really needs to be a multi millionatire and travel first class all the time. Better still, have one’s own private jet. One of my college roommates is in that class of travel, Kate. She flies via private jet with her menagerie around her ~ 3 dogs, 2 cats, and assorted birds. You seem to have good reason for caution when Phil asks if you are free, it would seem. Not a ‘pick up some peppermints for me’ kind of person. You didn’t even get to see the aircraft? Nope. Needed to dash back to the kids who were with my sister. But I board a 747 next week for New York. I’ll keep my eyes peeled then. When I was younger, the thought of flying created a certain excitement, mixed with a dash of anxiety; but, once airborne, I nearly always enjoyed the experience. As I’ve aged, however, I’ve come to be more wary. Now I simply view flight as a necessary expedient to getting from point A to point B as quickly as possible. I’m a bit like Roger, too, because the thought of “sharing” with enough folks to populate a small village is somehow unappealing. 850+? Really? Spending part of the day as you did though, just people-watching, holds HUGE appeal! Thanks for sharing!! Thanks for reading, as always, Karen! I have always loved flying – I’ve flown a small Cessna. So every takeoff holds wonder for me, and I spend my time craning out of the window I am careful to book a seat next to. Glad you had a chance to document the inaugural flight, Kate. I love the opportunity to meet and chat with people. They always have exciting stories to share. What a wonderful experience, Kate. It was great, Judy 🙂 Well worth the drive into Heathrow. The Daddy sign – reminds me of the time my husband got home after three months away. A nice thing to watch even when you’re personally uninvolved. It is. There’s always the knowledge that there have been long lonely moments running up to this reuniting….but the joy when the kids finally see their daddy is unconfined. And very precious. always nice to have a bit of adventure added to a day! Must admit I do not share your enthusiasm for airports. And Heathrow is a place I avoid at all costs. Still smiling at the “Daddy” sign. How many daddys do you suppose were getting off that plane? But in that little girl’s eyes, there’s only one Daddy. And that’s as it should be. Oooo… that’s exciting. I’d be pumped up for several days at the experience. How cool Kate and good for Phil spicing up your day 🙂 I’ve really missed your writing and catching up on your news! So exciting to see that you’re off to New York…safe travels and enjoy! I love this image – such a great, tea-loving perspective 🙂 – and the Daddy sign too! Sometimes I got to take the controls for bit too… LOVED it! I just hope the new A380 has a tad extra leg room in cattle class… the Dutch are the tallest nation in the world and folding our long legs into the usual tiny spaces can be very tricky, especially for long haul. I read your post and realised I’m rather jealous of your day out… and I seriously like Phil’s “what are you doing tomorrow?” ideas !! !